Ruth was never one of my favorite Bible characters. I always that was thought of Ruth as this sweet, submissive woman who fits the stereotypical “good woman” role. And there is nothing wrong with women who fit that criteria, but that is something that I have had trouble relating to and idealizing. But recently when my Bible study focused on the book of Ruth, my view of Ruth shifted. I began to see her as a bold, strong woman who had a work ethic as tough as nails and didn’t wait around for good things to happen to her — she went out and did something about her situation. 1. Don’t wait in the desert. 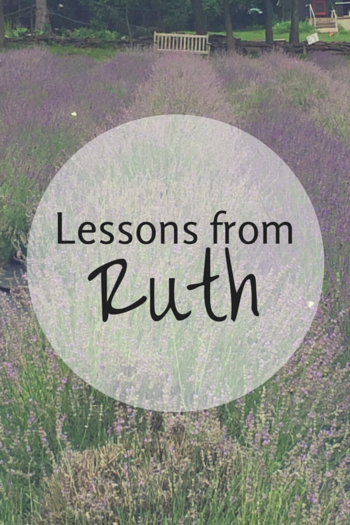 Ruth didn’t vacillate and wait for God to tell her where to go — she just went. In fact, God doesn’t show up in a very apparent way in this book. Ruth and Naomi just did what they thought was best and returned to Israel. There was no writing in the stars to tell these two women what God wanted (that we know of, anyway). But God still blessed them in the choices they made. It reminds me of a quote a mentor once told me: you need to be moving to allow God to redirect you. 2. Be bold. Ruth fearlessly stayed with Naomi even when her mother-in-law urged her to go. She fearlessly ventured into the harvest fields to work for food (there were plenty of risks for her as a single woman). And she fearlessly followed Naomi’s urging to essentially propose to Boaz, even when it probably wasn’t very acceptable culturally. And we don’t once hear about Ruth complaining or pushing back. That’s the type of woman I want to be.